PERSONALLY GUIDED HISTORIC TOURS are available at both Ruthmere and the Havilah Beardsley House. Ruthmere's docents have built an unparalleled reputation for excellence in knowledge, warmth and charm. 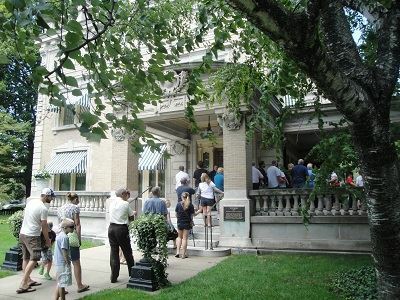 Learn about the history of the founding of Elkhart, the Beardsley family and their legacy of art, architecture and culture from a Ruthmere expert guide. SELF-GUIDED TOURS of outdoor sites and attractions in Elkhart are available via TourElkhart.org. Experience history, art and architecture in the palm of your hand! TourElkhart.org is a series of FREE self-guided mobile tours presented by Ruthmere in partnership with PocketSights featuring sites in Elkhart County, Indiana. Click this link for more information. SEASONAL TOURS of unique elements of Ruthmere Museum Campus are offered regularly. See Ruthmere decorated for the Holiday season every year starting the Saturday after Thanksgiving through December 30. Watch for the special evening tour times between Christmas and New Year's. See calendar for details. SPECIAL EXHIBITS are hosted at both Ruthmere and the Havilah Beardsley House. Come see something new at Ruthmere Museums Campus. See calendar for details. Ruthmere and the Havilah Beardsley House are open for the public for the tour season April 2 - December 29, 2019. See Holiday closing dates below. -Ruthmere and the Havilah Beardsley House will be closed Easter Sunday. -Due to the Breakfast of Champions event on April 25, Ruthmere and Havilah Beardsley will open for tours at 1pm. On Free Family Sundays, the first Sunday of the months April-November, EITHER Ruthmere OR Havilah Beardsley House is CLOSED while the free tours are conducted at the other site. See Free Family Sunday page for specific dates. The museum operates on Eastern Time. -Children under 5 admitted free with adult. Ruthmere Campus is annually closed for tours to the public January 1 - March 31. See calendar for special events during this period. Note: Ruthmere Members have free admission to all attractions -- See membership page for benefits.